No one was more excited than me back at the end of January when Milk Makeup* arrived for us UK/ Ireland folk exclusively at Cult Beauty*! As well as being sent some minis (which is an amazing way of trying new products, especially the spendier skin/ base products without the commitment!) I immediately ordered the cult, must haves that I’d heard so many good things about. Spoiler alert…but I’m seriously impressed and yet to dislike anything I’ve tried so far! I’m sure I’ll speak about more Milk products at some point, but let me know if there’s anything specific that you’d like a review for! One of the things I was most interested to try and their newest launch (it dropped at Cult Beauty on 12th March and I was waiting in the wings to snag it fast! 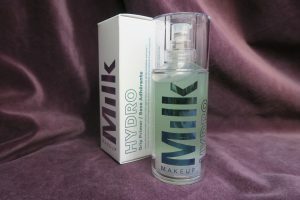 )…the Milk Makeup Hydro Grip Primer*! ✖️ Green tinted formula, but blends in clear – suitable for all skin tones and types. This primer has pretty hefty claims, but I’ve got to say…it’s probably one of the few that actually delivers! 1-2 pumps depending on the level of glow you want and with it being that slightly more generous size (45ml) it’s going to last ages, even with everyday use! It’s fragrance free as promised and applies smoothly and does give the most beautiful glow. It has no glitter or light reflective particles of any variety which is like a breath of fresh air in terms of radiant primer! One of my other favourite primers (if you can call it that, it’s kind of a primer/ illuminator hybrid) is the Charlotte Tilbury Hollywood Flawless Filter* which does have that light reflective more highlighter finish, so if I really want to amp up the glow…I use that one after the Hydro Grip on the high points of my face. Milk says to leave it settle for a minute to activate the grip and you can really feel it, it starts getting comfortably tacky (you could still wear this on bare skin and it wouldn’t feel sticky at all…I have done a few times, or when I’m just wearing a little concealer on ‘no makeup, makeup days’) and it gives makeup a perfect adherence without that ‘post yoga glow’ fading. I love the packaging! 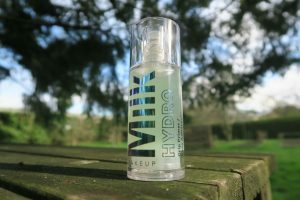 Milk’s signature clean yet slick and lightweight design, this formula really lends itself to having a pump bottle rather than in stick form (like most their other skin products) which I do like too…I just enjoy this being as is! Makeup goes on so well over it and it makes everything just look fresher, glowy and more plumped, which let’s face it…is always a good thing when it comes to your face! Another non silicone primer I actually like (a lot actually) is the Too Faced Hangover X Primer (UK*/ IE*), that hydrates but with not as much glow if that wasn’t what you were looking for, that’s definitely worth a go. As well as how it makes my skin look, this stuff isn’t playing with it’s grip and all day hold claims…my makeup looks significantly fresher and lasts all day/ looks way better at the end of the day compared to no primer and other primers I’ve tried! Conclusion…I LOVE the Hydro Grip Primer*! A product actually living up to all claims rather than the odd few (or none ugh, had a fair few of those unfortunately!) is seriously impressive. Like I said I can see the bottle lasting ages, but I’ll 100% be repurchasing this. It preforms really well and is a pleasure to use, a product to rely on and I’m going to say it…even at this stage of using it for just over a week, a true holy grail! No matter what your skin type, in my opinion it’s well worth a look…there’s a good chance you might love it as much as I do! Shop Milk Makeup exclusively at Cult Beauty* if you’re in the UK/ Ireland or on the Milk website if you’re in the US only (unfortunately they don’t ship elsewhere as yet, but keep an eye on their social channels for any future updates…it would be amazing if Milk was available to all to try! ).